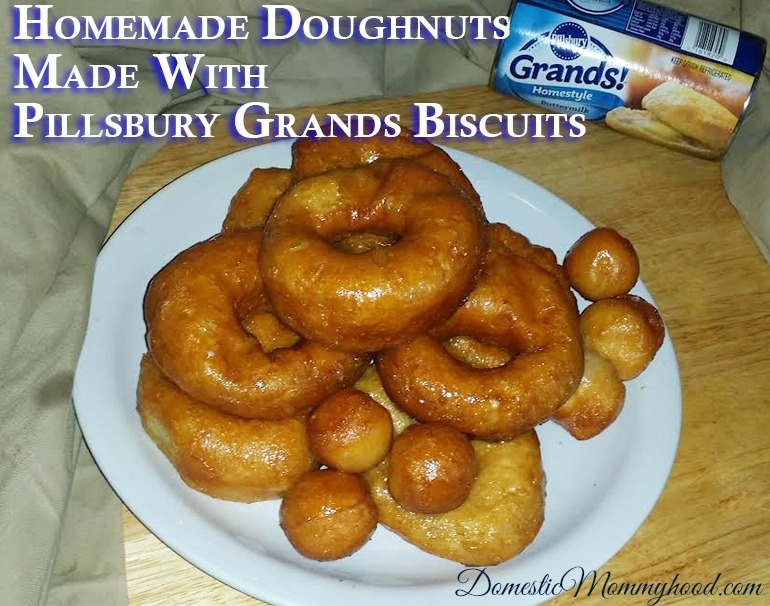 One of my favorite breakfasts when I was growing up was my Mom’s famous Homemade Doughnuts which she made out of biscuits. It has taken me a few years to figure out how she did it…….. she had forgotten but I finally duplicated it! They are very easy to make and will have your kids hopping with joy on a snowy Saturday morning. Open your can of biscuits and lay flat on a cutting board. 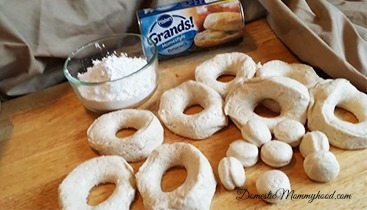 Take your shot glass or baby bottle and press the open end in down on the dough to cut out a hole in the middle, do this for all 8 biscuits, keep cut out middles to make doughnut holes. By the time you get done prepping your biscuits, your oil should be ready. To test drop one of the biscuit middles in the hot oil, if it bubbles it is ready for you to fill the oil. Do not over fill, you don’t want them to overlap. Let them cook for about 1 minute on each side (should be golden brown when you remove them from oil. Upon removal, I like to sit them on a paper towel to soak up the excess oil. Allow to cool while you prep the topping. Toss each doughnut in the mixture and place on a plate. Combine cinnamon and sugar in a medium bowl. Toss each doughnut in the mixture.